Californians have spent December experiencing the effects of the Pineapple Express. For the most part, we've been happy to get all that rain. But in 1846, the Pineapple Express had a quite different effect. It contributed to the horrible fate of the most infamous California-bound party in history. To be fair, a lot of things killed members of the Donner Party, including the Donner Party. No, not just that way. The "party" wasn't so much a single unit as a shifting group of people — and most of them hated each other. They had good reasons to do so. The first major folly of the party started well before winter, before they entered what has now become Donner Pass. Their problems began in Wyoming, when they decided to follow Lansford Hastings. He told them that he could show them a way to the mountains that would be faster and easier than the famously tough Oregon Trail. Hasting's Cutoff was a route that took the party south from trail, though the Great Salt Lake Desert in Utah. They steamed during the day and froze and night. Their oxen starved, died of thirst, or were stolen. And the members of the party didn't exactly cover themselves in glory. One hot afternoon, two of the men got into a fight. One carried a whip, and one a knife. The man with the knife won, but was put off the trail. When the banished man's wife had her last few oxen stolen, the other members of the party refused to help her, and she and her children had to walk behind the wagons. By the time the group got to the Sierra Nevada mountains, they were a ragged amoral bunch of people who spent that horrible winter alternately killing, betraying, abandoning, or extorting one another. Still, they might have made it through alive, if the weather had been on their side. In 1971, Roland Madden and Paul Julian discovered an interesting cyclical phenomenon over the Pacific and Indian oceans. The Madden-Julian Oscillation consists of intense rain interspersed with the total suppression of rain. It lasts about 30 to 60 days, and it doesn't spend all that time in one place. The MJO travels slowly eastward, from the Indian ocean out across the Pacific. Sometimes, just off the coast of North America, it meets arctic air coming down from the north. The two combine, and dump massive amounts of rain over the northwestern United States. The phenomenon was nicknamed The Pineapple Express, since it originates in the tropics. Sometimes it swings a little south, dumping rain into California. And sometimes it endures and travels inland, bringing apocalyptic blizzards to the Sierra Nevadas. This weather phenomenon is what really brought up the death toll for the Donner Party. The extraordinarily huge blizzards that struck the Sierra Nevadas in the winter of 1847 dumped twenty-two feet of snow. All that snow made it absolutely impossible for the wagons to go on, even if the oxen hadn't starved to death. The party members who couldn't travel camped high in the mountains, by Truckee Lake. They sheltered in shanties of sticks covered in cow hides — cow hides that they took from one another for food when things got bad. The snow delayed a smaller group, dubbed The Forlorn Hope, who strapped on home-made snow shoes and tried to go on through the mountains. Two members of the Forlorn Hope had fled upon hearing that they would be eaten, but the snow confused them into wandering lost in the mountains for days until the rest of the group happened to see them. As promised, the group shot and ate them. 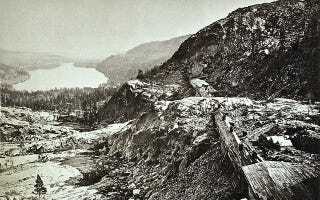 And, in the end, the snow hampered repeated rescue efforts made by soldiers at the relatively nearby Sutter's Fort to reach the scattered encampment at Truckee. In the end, of the 87 members of the party, 48 made it to California, and all of them became local legends. The Pineapple Express has its own legendary status, but it's rather more lighthearted than you'd expect, considering the damage it did.